Morinosuke Kawaguchi is honored to be invited back to Malaysia by the Malaysian government. Last year Morinosuke was a a keynote speaker at the World Innovation Forum Kuala Lumpur 2013, invited by the Office of The Honourable Dato’ Sri Mohd Najib bin Tun Abdul Razak, the Prime Minister of Malaysia. This year, Morinosuke is invited by the Institut Darul Ridzuan (IDR), a public policy think tank for the Perak State Government. 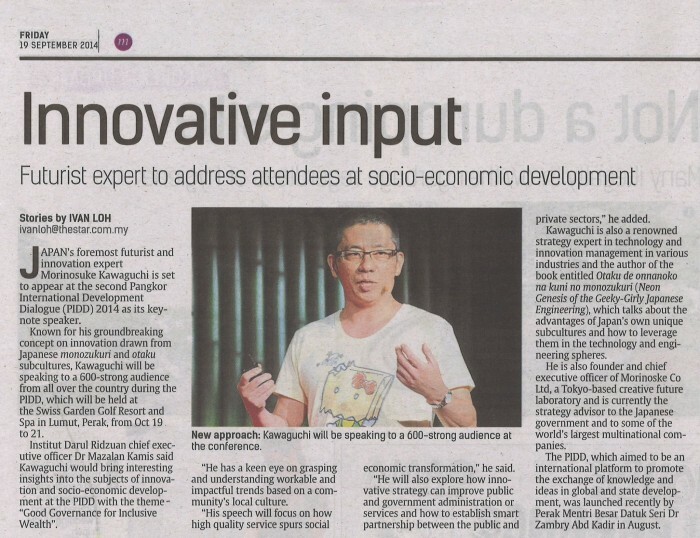 He will make a keynote at the Pangkor International Development Dialogue (PIDD). 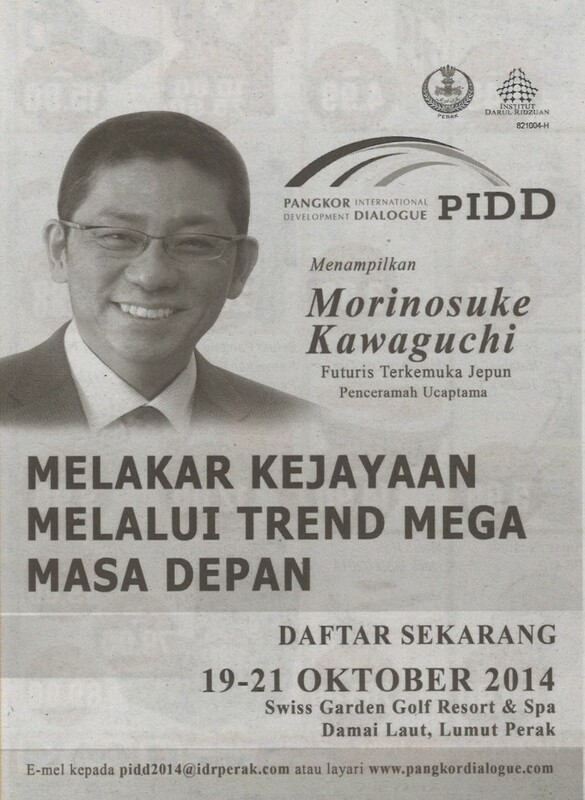 The theme of PIDD is “Good Governance For Inclusive Wealth” and Morinosuke’s speech will focus on how “High Quality Service Spurs Social Economic Transformation”. He will explore how innovative strategy can improve public and government administration/services and on how to establish smart partnership between the public and private sectors. Malaysian media, The Star’s article on Morinosuke Kawaguchi 2014.Sept. 19. 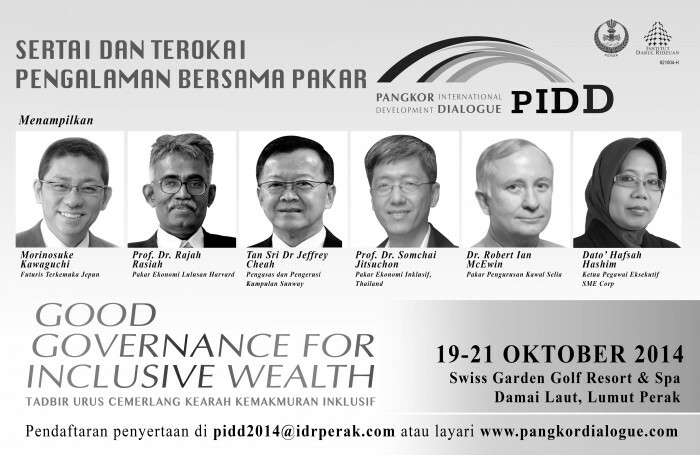 Institut Darul Ridzuan (IDR) in collaboration with the Perak State of Government will be hosting a Pangkor International Development Dialogue (PIDD) 2014 at the Swiss Garden Resort and Spa, Damai Laut, Perak, Malaysia from 19 to 21 October 2014. Institut Darul Ridzuan (IDR) is a public policy think tank for the Perak State Government. IDR was initiated by Menteri Besar YAB Dato’ Seri DiRaja Dr. Zambry Abdul Kadir, in his effort to transform Perak into a more developed state – a vision that is laid out and elaborated into a blueprint named Perak Amanjaya. 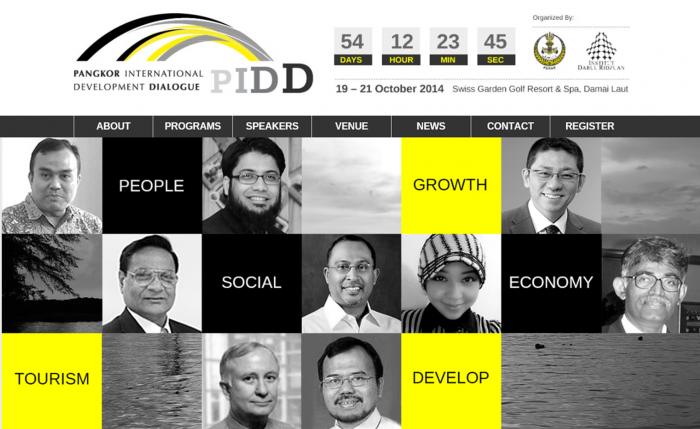 PIDD, Pangkor International Development Dialogue 2014, with the theme of “Good Governance For Inclusive Wealth” is aimed to provide a platform to exchange of views and knowledge in national and state development, Perak in specific. Perak is the second largest state in Peninsular Malaysia, after Pahang. The Dialogue also seeks deeper insights and analytical and integrated solutions to enhance the socio-economic of the people as well as position of Perak State Government’s stature in Malaysia and Global arena. They are expecting 600 participants, from various fields of profession; policy makers, businesspeople, economists, lecturers and students, politicians, government officers and journalists. The Chief Minister of Perak, Datuk Zamry Abdul Kadir will be officiating the event and among the speakers is former ASEAN Secretary General, Dr. Surin Pitsuwan from Thailand. Morinosuke Kawaguchi was a keynote speaker at the World Innovation Forum Kuala Lumpur 2013 in November. It is with great honor that we announce that The Prime Minister’s Office of Malaysia invited Morinosuke Kawaguchi to the World Innovation Forum Kuala Lumpur 2013. The Honourable Dato’ Sri Mohd Najib bin Tun Abdul Razak, the Prime Minister of Malaysia opened this magnificent event where 1500 delegates from 25 countries deliberated all aspects of innovation. They event attracted about 10,000 visitors. Morinosuke was among some very distinguished presenters. Morinosuke spoke on November 14th, 2013. Based on his unique innovation model, Kawaguchi challenged his audience to cast a deeper look at micro cultures for hints for successful product and service innovation. In a world that becomes more diluted through globalization, identity and distinctive features need to be regained. And it is by looking at today’s subcultures – excellent mirrors to reflect consumer needs – that this can be achieved. This lecture is for people looking for innovative ideas as well as for new models in product value creation and branding. Buses in Kuala Lumpur as well as digital signs all over the city were advertising the event with the four keynote speakers’ faces, including Morinosuke’s. The others–in order of appearing on the bus, right after Morinosuke–are professor and 2013 TED Prize Winner Sugata Mitra, Grand Prix Motor Racing Boss Mark Gallagher and Former Prime Minister of Sweden, Göran Persson.